A Midsummer Night’s Dream at the Southwark Playhouse. Photo: Harry Grindrod. Of all the Bard’s work, Dream continues to prove a favourite for companies and audiences alike. Every year as the evenings stretch out, the actors come prepared, adorned in glitter and fairy wings to resurrect Shakespeare’s most mischievous of comedies. Glass Half Full and Go People’s production suggests no such whimsy as you enter the auditorium. 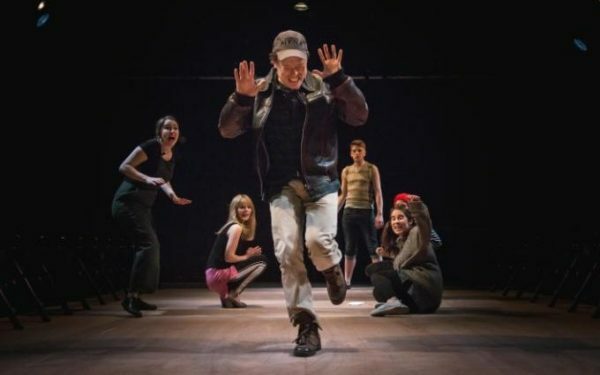 Only a plywood set, a table and chairs, and actors delighting self-referentially in the challenge they have set themselves: to perform the seventeen-character strong play with seven people. Wildly hacking Shakespeare to bits for the sake of comedy is nothing new – the Reduced Shakespeare Company have built whole careers out of it – so I admit I came to this one with trepidation. Two hours of flailing, shrieking actors does not a comedy make. One could even call Go People’s interpretation a narcissistic one, using the Rude Mechanical’s play-within-a-play subplot to further turn our attention to the tribulations of ACTING, rather than the play at hand. Having said all this, my reluctant, critical heart was thawed by this production. Joyful from start to finish, the cast attack the text with gusto and distil its most important elements to their purest form: bawdy laughter and impish imagination. From the moment the lovers enter the forest we are urged to ‘imagine a tree’, ‘imagine a leaf’, imagine a storm brewing, snow falling, fireflies twinkling. There is an earnestness to Ludovic Hughes’ entreaties that is difficult to reject, and we are further enveloped in the cast’s fairytale world by a bout or two of audience participation which brought a grin to even my fellow scribbling critics’ eyes. In fact, earnestness personifies the performances all round, negating the potential narcissism of the premise. We buy into the actors’ plight and their love affair with the forest, we slip into it as if into a faintly frantic dream. Freddie Fox is a stand out doubling as an unctuous Demetrius and astoundingly hammy Nick Bottom, with particular mention going to his physical transformation halfway through the play. Melanie Fullbrook’s Puck is charming and apologetic, adding much-needed warmth when the play threatens to run away with itself. Much ado is made of the dashing on and offstage in the final act, threatening to push things over the edge from choreographed bedlam into an actual theatrical trainwreck, but the culmination of Pyramus and Thisbe ensured that the audience barely even noticed. Be warned: Do not darken the door of the Southwark Playhouse expecting a remotely reverent Dream. We’re told early on that this isn’t a production for purists, and why should it be? The play exists, and even thrives in this imagining. Trading delicacy for entertainment, the madcap farcical nature of Shakespeare’s comedy has been bottled here for our enjoyment. Shorn of the fairy lights and flower crowns, the stilted poetry and subdued magic of traditional productions, one feels that this balls-to-the-wall, slapdash, rude and brutish go at the play would have been right at home in the Bard’s own lifetime. This particular Dream is mischief personified, precisely as Shakespeare would have wanted. A Midsummer Night’s Dream is on at the Southwark Playhouse until 1st July 2016. Click here for more information.